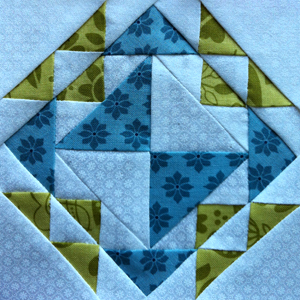 Contrary Wife is a very simple quilt block. 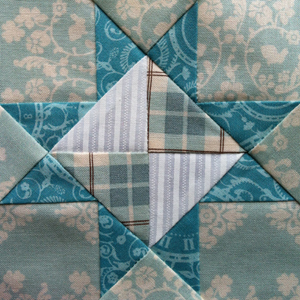 Very similar to Maple Leaf, Spool and Snowball—each made of basically a nine patch, but with some patches consisting of half square triangles. Depending on where you place those triangles and in which direction and colour, you can create endless patterns. And again, I have seen this block done in so many different variations, some using more than three different prints, others using only two. But for me, only Lauries example really works—at least if you want to stress the block’s name. Stress should lie on the prints facing each other in opposition. If you do the three or four of the five squares in a different colour than the rest, or if you choose to do the triangles in four different prints or arrange them so that the same prints do not face each other in the centre, you will end up with a completely different effect. Not ugly, but just not contrary wife-y. Posted in Uncategorized and tagged contrary wife, contrary wife block, farmer's wife, farmer’s wife quilt, quilt, quilt block. Bookmark the permalink. I miss the squash in this block. Corn, beans and squash are the Three Sisters that were always planted together, according to Native American tradtion (Iroquois, I think). Corn, being the primary crop, is growing better in community with other crops rather than on its own. Beans and squash each complement the growth of corn, and the three also benefit of each other. 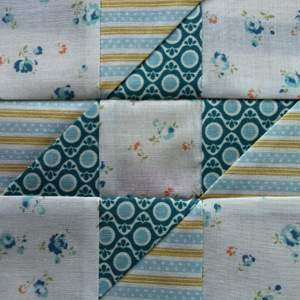 But we do have the Squash Blossom block in the sampler, so all in all the Three Sisters are growing together. Posted in Uncategorized and tagged corn & beans, corn & beans block, farmer's wife, farmer’s wife quilt, quilt, quilt block. Bookmark the permalink. When I think of a country farm, pictures of Lancaster County come into my mind. I visited this part of the United States in 1999. The farm houses there looked very different from the ones I am used to around here, and of course this different look attracted me. But I guess the countryside itself—looking differently than at home—streets, fields, fences, and creeks, all looking strange, made a strong impression on me, and shaped a new picture of a typical country farm in my mind. The question remains what this star block has got to do with a farm? As with many other blocks, I found other versions in the internet that slighty differed from Laurie’s. What they have all in common is the star, only the inside of the star varies. I think this is a very rewarding block. You can use four different prints in a very tidy structure. I especially like the way that the star’s rays are accentuated, because or even though I used the darkest fabric for them. Posted in Uncategorized and tagged country farm, country farm block, farmer's wife, farmer’s wife quilt, quilt, quilt block. Bookmark the permalink.